I wanted to try a new technique of knitting with 2 colors. Some will say, "but you already did a 2-color hat with your Striped Slip Stitch Hat." Yes, that is true. However these two hats are different. The Striped Slip Stitch Hat uses the slip stitch technique which only requires you to knit with one color on each round. This Oblique Hat requires knitting with both colors on each round. I've designed this hat based on a combination of VS3.10xBW1.10. I'm sorry, the hat pictured above doesn't really show off the diagonal pattern of this hat very well. I used a blue/white variegated with a white solid. It was a poor choice to pair together because you "lose" the pattern when the white in the variegated yarn is adjacent to the white solid yarn. This hat would look lovely in two solid contrasting colors. 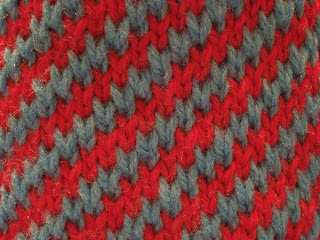 To "see" the pattern in the photo above, first look for the diagonal white line, then you'll see the stripe created with the variegated blue yarn. Knitting this hat was a bit awkward at first when I had to switch yarns on my right hand every 2 stitches. I had to be careful not to get the balls tangled up! Then I eventually figured out that I could hold the Main Color with my right hand and the Contrasting Color with my left hand (kinda like how you would knit Continental style) ... slow going and differently awkward for me. I guess it just takes getting used to. I think I had a tendency to knit a little tighter because of the newness of knitting with both hands this way. As a result, this hat is a snug ladies small. I continued the pattern in the decrease. Other than the awkwardness of holding 2 yarns, this hat is pretty mindless knitting once you get the hang of the pattern. After you have made this hat once, you can make it again without referring to the pattern. It's great for knitting in the car or while watching TV. Oblique Hat pattern can be downloaded from Smariek Knits Yahoo Group. most excellent hat. love that diagonal design and i think it works really well with that blue variagated myself :) 15 Karma Caps...wow you are really paying it forward Marie. Great job! You are a prolific knitetr and most generous gal to share all your patterns, Marie! Really like this hat and will have to give it a try, although I am not sure how I will do with keeping up the pattern with my attention span. Thanks for the visit today, it was fun.